As I got older my mom would sometimes have trouble figuring out what to get me for Christmas. She would sometimes resort to the flawed logic of “Chris likes (insert pop culture event here), therefore any manufactured object relating to that is fair game.” This culminated in 1997 when the Star Wars Special Edition movies were playing in the theaters. I was very excited to see them and probably mentioned them a bunch of times throughout the year. That Christmas she combined my interest in Star Wars with my dislike for alcohol gave me a large Star Wars themed beer stein. I liked legos when I was young. Ergo, Bionicle for three years straight. This year, I got puffy plaid Pakistani pajama pants. I usually get a 100-disc spindle of DVD+Rs, some money, some snacks, and maybe some dollar-store handyman supplies as stocking-stuffers. I couldn’t ask for a better present. 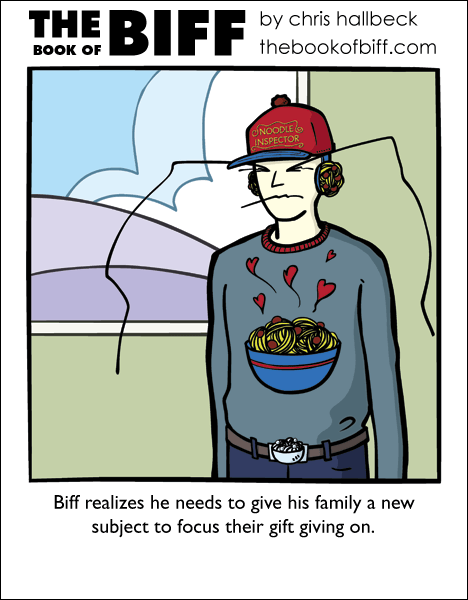 I am jealous of Biff’s noodle inspector hat. It is classy to the umpteenth degree. I used to get art supplies at every gift giving occasion from most all of my relations. So much that i never actually had to buy any untill one year when i made some joke to my dad about the year’s “obligatory art supplies”. ever since then i’ve had to actually pay for my pens and paper. legos, always legos for me. bricks, not technic or anything like that. and almost always lego star wars. why, just yesterday i got a new set of lego stormtroopers for my army, and lego star wars 2 for the ds. i have become quite the authority and brickmaster of legos. … OMG CRAZY IDEA!!!!! MUST MAKE LEGO BIFF!!!!!!! Every year, what do I ask for chirstmas? Gaming stuff. Every year what do I get? Clothes. But my parents this year went all-out getting stuff I really like – a fully-adjustable dressmaker’s dummy, a Wacom drawing tablet, a copy of Photoshop, and $200 in cash. I’ll either end up spending that money on fabric, or it’ll go into my ‘Flatbed Scanner Buying Fund’. We tell each other what (in borad categories) we want. It limits the disappointment, even if it limits the degree of surprise, too. So, when I opened the box contain the complete works of Monty Python yesterday, well, I wasn’t terribly surprised, but I WAS greatly pleased. I can’t helpt to relate Biff’s noodle inspector tshirt with the song don’t play with your noodle…. I am honestly shocked by this revelation of his sexual preferences. @teh noob: Can you post an image of Lego-Biff when you’re done? I love legos, but never had enough to be truly ambitious. LEGOs were my thing as well. I’d get a set from each relative. Now that I’m a casual computer gamer who never leaves my lair, normally it’s mundane things like clothes. Though, this year booked me a 22 inch Widescreen monitor. Have to agree, that noodle inspector hat is pretty sweet. I got nothing this year. That’s right … Nothing. It just ain’t christmas without Lego! I want that hat. It looks so darn awesome! i agree with speaker – that belt is badass. It was all so easy and great when you were a kid! You’d just get your favourite toy and it would all be good. I’d always get LEGO and often times also some new ice hockey equipment which was always cool. If anyone doesn’t know what to get me for Christmas, they know anything dragon-related will work. I love collecting the stuff. Keychains, statues, mugs, even stuff I’d never use I’d gladly accept if it has a beautifully-carved/painted dragon on it. This is by far the absolute worst thing about christmas, you have to remember to tell your parents that you’re fine without gifts related to what they know you’ve checked out recently. But hey, at least this allowed me to get all three books of biff yesterday. Sorry about this double post, but I had accidently sent before finishing. But it also got me a game that I had already rented and pretty much beat. I don’t know if any other families follow the same tradition, but the first few nights are nothing gifts, that my brother and I asked for a few packs of gum, a box of peanut brittle (Yum!) from sees candies, little things. Then the whole family (my mom’s side, anywway, only 4 memebers on my dad’s side) and we have our big party, where the good stuff is. Ours is tomorrow, I’m exited! Last year it was a great new bike (and bike lock) after the one I allready owned was stolen. I know I’m geting a copy of left 4 dead, who knows what else? Those earmuffs are cute! ^_^ I want some! Ahh theme presents. One year my grandmother went, Gail likes the color green, there for green presents. Green post-it notes, white out with a green container, green toy chiceken,it was so much fun. This year however I got the stuff that clearly screams we know nothing about Gail, candles I’m allergic to, handbags I’ll never use, gift cards to stores I don’t shop in, and a recipe book when I don’t cook. I didn’t get much this year. working on it. going great, but expect some color weirdness. the eyebrows and maouth are killing me to make though! Pretty much my mom’s gift giving, exactly. I like snakes, so I get…’Runs With Snakes’ hoodie, ‘Eat Sleep Herpetology’ sweater, ‘Bite Me’ tee, snake earrings, snake bumperstickers, a snake x-ing sign, snake necklace, snake pin…and a breadbox. No lie. For me it’s goldfish. It’s spread to the point where my boyfriend’s mom sent him a goldfish-themed birthday card this year because -I- like goldfish. Wait…so this means Biff *has* a family (as opposed to being the product of asexual reproduction)? Christmas this year was full of owls. My parents bought me about 10 or so different owl statues, including hand-carved stone ones. It was awesome, but a little variety would’ve been cool, too. I’m also glad one of my grandmothers gave me $100 in Christmas money, which I used to buy a copy of The Orange Box and a huge stack of books. I’m into vintage radios, record players, that sort of thing, but my relatives just don’t know what to look for when buying that sort of thing, and always leave it to the last minute. So this year I got a gramophone with a mainspring that popped on the first playing, a transistor radio of unknown age and origin that may well be a repro and a Marconi valve radio that doesn’t work on FM and has rapidly peeling paintwork. @trueblaze: That’s why I ask for cash every year and I get something crap anyway. I was given a Xbox 360 as a gift months later. This was last year. This year, someone gave me a Hello Kitty ‘Sleeping Kitty’ AM/FM clock radio for Christmas. It was my idea in the first place. However, it didn’t show up until after New Years. Chris, have you ever considered making a Biff belt buckle? ZOMG, Biff has a family?! RUN FOR YOUR LIVES!!!!! !